One of the alluring things about investing is the prospect of rare sightings of anomalies. In a torrid market, typically, the universe of value Longs tends to expand relative to bull times. The opposite - an anomalous over-pricing in certain pockets - is rarer. One such example is OneLife Capital Advisors Ltd (Bloomberg: OCAP IN; "OCAL" or "Company"), a recently listed Indian company engaged in providing financial intermediary services, an aspiring equity broking franchise and portfolio management services company. 'Aspiring' is the operative word, as OCAL was incorporated in 2007 and commenced business in September 2009. As the Company admitted, there is little to look at in their limited operating history. Nevertheless, market participants enthusiastically bought into the Company's prospective story. Overall IPO was subscribed 1.53x, with retail participation at 2.5x allotted portion and Institutional interest at 1.02x. People are an investment banking franchise's key source of competitive advantage. Superior deal sourcing, well-entrenched network of corporate relationships and deal history help differentiate one player from another in this competitive industry. Moat can also be derived by specialising in niche pockets (e.g., debt restructuring/resolution, mezzanine financing). A generalist investment banking franchise with limited history of operations, promoter pedigree and key employees (there were 11 employees as of the IPO filing) competes from a rather weak position. OCAL has all the ingredients of this eclectic combination. Broking is a fiercely competitive business, bearing a natural correlation with the capital markets. Except for instances where a broker serves an underpopulated segment in the market, pricing power is low and players compete fiercely in a race to the bottom of the price pyramid. Other means of building a moat is timely and best execution, low slippages, pre-trade investment research, post-trade execution services and attractive terms on margin funding. Revenues are primarily a function of volumes. As a result, waning volumes in a weak/sideways moving market has a negative impact on business. Well-entrenched incumbents tend to buy growth or rely on ancillary activities to drive revenues. A new, small-sized entrant would run into a gladiatorial arena full of competitors. OCAL is in such a position. This is a typical hedge fund structure, with respect to fees, that is. Performance-wise, there isn't much to be said about this group as a whole, in both absolute or relative terms. Revenues can form a good annuity stream (upfront yearly management fee) with optionality driven by Carry (a cut of profits). Recurring revenues are contingent on assets under management, which encourages management to embark on asset-gathering exhibitions to support revenue growth, sometimes to the detriment of investment performance. Differentiation is largely a function of investment performance than fee structures. Long history of superior performance under (hopefully) the same investment manager lends much credibility and strong competitive positioning. OCAL neither has the track record nor the personnel to guide this operation. A majority of its recent IPO proceeds (~35%) was earmarked for this venture, which hitherto contributed nothing to its topline. Attracting the right talent for this venture would not only prove difficult, given its history, it would also entail a large capital outlay; which will likely keep expenses on a rapid growth trajectory relative to revenues. It is difficult to envision OCAL achieving sustainable profitability, let alone cash flow, in the medium-term, given the scheme of affairs. With this background, it is insightful to glance at a quick comparison, contrasting OCAL with a competitor, Brescon Corporate Advisors Ltd (Bloomberg: BFS IN). BFS IN is an investment banking franchise specialising in debt syndication, restructuring and resolution services. It is also involved in real estate and private equity financing. 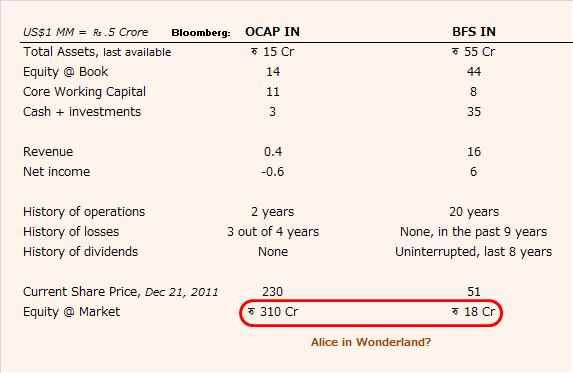 OCAP IN has doubled since listing in mid-October. My interactions with the lead manager to the issue were illuminating. OCAL's current investment banking mandates = $95 mm (have to rely on the weight of words of the management). The revenue stream is a fraction of this value and payments are received based on achievement of milestones. Working with a rather liberal 50% p.a. growth rate in mandates over the next 3 years and a 5% fee arrangement (typical, 1%-2%), the mandates would translate into revenues of ~$15 mm, which would accrue to OCAL over a period. Moving on to Portfolio Management Services. $2.5 mm is the initial funding received from IPO proceeds. Let's assume Management manages to grow assets under management (alliteration unintended) to $200 mm over the next few years and can charge 3% of AUM as fixed-management fee (typical, 1.5-2.5%). This would translate into revenues of $6 mm. Equity broking is a function of volumes. The largest company, Religare Enterprises managed volumes of $800 mm / day in 2010-11. Assuming OCAL manages 10% of this and using an average brokerage rate, this business would add ~$10 mm to OCAL's revenues. One of the ways of running a low-cost brokerage operation is to focus solely on execution, without adding ancillaries such as research (which add to costs). It was unclear, from my interactions, whether OCAL intended to take this route. For a company with minuscule revenue, limited history and anything-but-upbeat business prospects, the stock enjoys good short-term momentum trading interests (daily traded value = $8 mm). The run enjoyed by companies like OCAL is a characteristic generally commonplace in bull markets. Market participants are expecting a stupendous show from OCAP IN over the next few years. With a drop in trading volumes and slowing investment banking mandates, the environment has been tough for players like BFS IN and indeed, for many players in the financial intermediation services industry. A situation that is likely to persist over the near-term. Another possibility behind the strong stock performance 2 months post-listing could be a take-over attempt by a larger rival, which appears remote. These are the sort of occasions when one misses the ability to initiate a short. Disclaimer: This is not meant to be an invitation to indulge in speculative activity. Please consult your adviser, and more importantly, your judgement, before making investment decisions. I can see what you see not Vision milky, then eyes rot. When you turn, they will be gone, Whispering their hidden song. Then you see what cannot be Shadows move where light should be. Out of darkness, out of mind, Cast down into the Halls of the Blind. But the above words from one of the most successful role-playing games from the 90s – Diablo – (who remembers it?) is apt for this edition. It’s an opportune moment to dive into the Corporate Halls of the Blind. In the Long Run we are all Dead: A Macroeconomics murder mystery The US economy faces a deep recession, raging inflation and an impending run on the dollar. President Wedik likes economics as much as a fish likes land. Should he listen to the Keynesians, who favour government intervention or the Monetarists, who favour market fundamentalism? Something has to be done soon to avoid an economic collapse. What? How? Who committed the murder? And why? The murder story could probably have been constructed better but the crux of the book is economics! Recommend it to those looking for a light read on macroeconomics without running the risk of drowning in jargon. This edition is about a topic that fascinates me: bidding behaviour. An investment prospect offers 100% return potential over your benchmark return (your ‘required return’). How much of this excess return would you be willing to pay/share upfront to participate in the idea? There were no right answers for this ‘buy in’. Only interesting answers. Dear SEBI. Can We Short Please?